Jerry Lembcke is the author of The Spitting Image: Myth, Memory, and the Legacy of Vietnam and PTSD: Diagnosis and Identity in Post-empire America. He is Associate Professor Emeritus at College of the Holy Cross in Worcester, MA and can be reached at jlembcke@holycross.edu. He’s an apparitional figure, often summoned by conversations about Vietnam veterans and Post-Traumatic Stress Disorder (PTSD). But he’s usually someone’s father or grandfather, a veteran of World War II, not Vietnam. And he’s deceased. Remembered by the storyteller, he is the veteran who never talked about his wartime experience: an unsettled fellow, moody, easy to anger, an insomniac fearful of his nightmares. He drank heavily at times. He was in the Pacific, at Guadalcanal—he never said more. I’ve “met” this reticent veteran more times than I can count. The most recent encounter followed my presentation on PTSD at an academic conference. The presentation had raised questions about the notion of “flashbacks” and the way it complicated the consideration of memories for diagnosis. Flashbacks were the re-experiencing of war-time events supposedly touched off by sights or sounds resembling the original experience. In a July 13, 2013 CounterPunch posting, I had written about the implausibility of stories that veterans “hit the deck” when hearing firecrackers or a car backfiring. I pointed out a 1994 article in the Journal of Clinical and Experimental Hypnosis in which psychiatrist Fred Frankel said that flashbacks were likely as much about imagination as memory. The facial expressions of the fifteen or so sociologists and historians whom I was facing conveyed a sense of not knowing what to make of her comment since it didn’t connect to anything that had come before or suggest where she expected the discussion to go. Seemingly because no one knew what to say next, the session ended there. Ironically, the haunting image of the veteran who doesn’t talk about the war, has itself persisted in American culture without critical examination. With another Veterans Day approaching, and with it, the almost certain reappearance of this reticent ancestor in our conversations, it’s a good time to consider the existential nature of the veteran in the story. What is the balance between the materiality of his existence vs. his figurative folkloric presence? If he is a conjured figure, what then might be the forces that call forth his being, and what might the role be that he plays in our post-war culture? Studies of myth and legend tell us that stories of indeterminate veracity often have more to do with the tellers than the people and places that they are about; it’s a methodological insight that shifts the inquiry to what’s going on with the person telling the story. In her book Social Memory and War Narratives, sociologist Christina Weber writes that children and spouses sometimes project onto family veterans certain qualities that they do not want to have disabused. Perhaps the woman telling the story is too embarrassed by the grandfather’s drinking and abusive behavior to attribute it to his personal failings. His alleged reticence, in that case, is her story-telling prop that elicits war related sentiments in the listener that suggests a more flattering and captivating account for his shortcomings. Or maybe she wants to believe (and wants her listeners to believe) that her grandfather acted heroically during the war. In that case, the association of the reticence with war trauma can be read backward to conjure his credentials as a combat veteran, not an ordinary veteran. To some Americans, male quietness signifies manliness. Men, after all, who have really done “it” don’t talk about it—an aphorism easily twisted to read: he never talked about it [so] he must have really done it. The identification of the subject—veterans as deceased—provides the teller some insulation from challenge: a researcher’s positing of the ancestor as fictive only makes him a kind of “negative” whose non-existence cannot be proved; and the distastefulness, if not ethical impropriety of questioning the authenticity of someone’s emotions and memories about a loved one are considerable. Speculation that the reticence functions as a “war story” for the woman telling it cues another consideration: that the ancestor-veteran is real, just as described—and that his silence is his “war story.” Most veterans, even those deployed to war zones, do not see combat; only about 15 percent of men in Vietnam did, a figure that is about the same across modern wars. 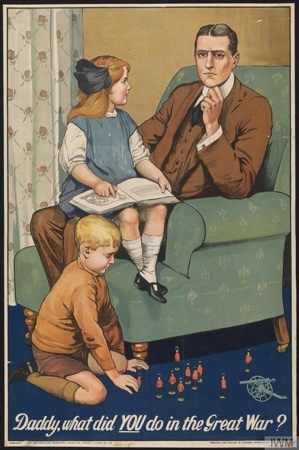 And yet, the societal expectation calls for the “combat” standard to have been met, a standard memorialized in a British recruitment poster for WWI in which a little girl sitting on her dad’s lap asks, “What did you do in the war daddy?” The anxiety about self-worth induced by the poster leads some men to volunteer for dangerous duties that will give them a story to tell their own little girls someday. Others, who never had combat opportunities or perhaps avoided them, might make up a story—a “war story.” A veteran’s reticence can function for that purpose: by saying nothing, the veteran sets the mind of his questioner to work filling in the blanks left by his silence. The images and storylines available to the listener for that are drawn from popular representations of war in which heavy combat is graphically portrayed. Without saying a word—and, thereby, avoiding the risk of sounding like a braggart—the veteran leads his listener to imagine his combat bona fides he can only wish he had. In the post-Vietnam War years, moreover, the association of reticence with trauma virtually insures that the authenticity of what the veteran has led his listener to believe will not be challenged—who, after all, is going to question the integrity of an already strung-out veteran? It is possible, of course, that some men are reluctant to talk about the wartime experiences they actually had and the reasons for that have to be considered. A discomforting answer is that his story is not one that anyone is waiting to hear. Military experience even in war is, by many accounts, more boring than anything else. It takes legions of clerical workers, maintenance crews, and logistical teams to keep the combat units up to snuff; their work varies little by where it is done, stateside or war zone. Most men in Vietnam not only saw little action but little of Vietnam. They spent their year there on huge sprawling airbases or large army compounds with accommodations that differed little from home, a description of the GI experience that Meredith Lair provided in her 2011 book Armed with Abundance: Consumerism & Soldiering in the Vietnam War. Boring and uneventful as it may be, the experience of military life in a foreign country at war is still hard to translate into terms meaningful to civilians. The veteran with stories to tell need see the glazed-over eyes of listeners only one time to know there is not much interest in what he did. A related possibility, then, is that the ancestor-veteran said little because no one asked, or asked questions that were not relevant to his time at war. My own homecoming experience is suggestive of this dynamic. My friends and family had quietly welcomed me home from Vietnam early in 1970, seemingly satisfied that I was okay, uninjured by the war. They watched my slideshow with interest in rice paddies, water buffalo, thatched huts, and artillery pieces as, respectively, cultural and technological exotica. There was not much interest in what I wanted to talk about: the war itself or the growing in-country GI resistance to it. The 15 percent of the troops who have seen combat are a different matter, of course, but the common associations of combat with trauma and victim-reticence have a tenuous relevance for explaining veteran silence. Victims of, say, sexual abuse might feel shame or embarrassment for what happened to them, feelings engendered by societal norms that hold victims responsible for their own debasement—the “she asked for it” narrative. But how would that apply to veterans? The prevailing U.S. culture is likely to receive combat veterans as heroes, not victims, and those bearing the hurts of war as real-deal warriors. Supposedly, reticence is a defense mechanism deployed by the veteran lest painful memories that have been “put away” be stirred and their recall set loose other mental or physical responses—like flashbacks. But research as far back as World War I veterans treated for shell shock reveals that soldiers not exposed to combat are more likely to exhibit symptoms of war trauma than those who have. Indeed, veterans wounded in combat are less likely to have been traumatized than those who have not. The phenomenon of veteran reticence has been under researched, if researched at all, which makes speculation about it all the more valuable. The entanglements of memory and imagination noted above become even more opaque when presented to us in a gauzy second-person form—“he never talked about it.” And like other figures of myth and legend, the very indeterminacy of his being lends it an air of enchantment. Lest researchers be seduced by its unknowns and unknowables, though, it’s important to recognize that the reticent veteran stories often function, just as did the one in my conference session described above, to divert attention from the politics, economics, and sociology of war itself, to the more emotional but less tangible issues of veteran well-being. Relatedly, the stories function, just as do the stories of spat-on veterans, to displace our memory of veterans, especially those of Vietnam, as politicized and empowered opponents of war, with images of veterans remembered as victims. Indeed, with that in mind, we should remember on this and every Veterans Day, that November 11 is a time to think about the terribleness of war and recognize those veterans, among others, who conscientiously resisted the violence of war. Some, at great legal risk to themselves and almost certain social disdain, stood up for peace while still in uniform; many more spoke out for peace in their post-service years. Until the research is done, we can only wonder if some reticent veterans feel silenced by a culture that does not want to hear their anti-war, war stories. Perhaps it’s time, this Veterans Day, that we ask the right questions and listen with open hearts and minds to the answers.